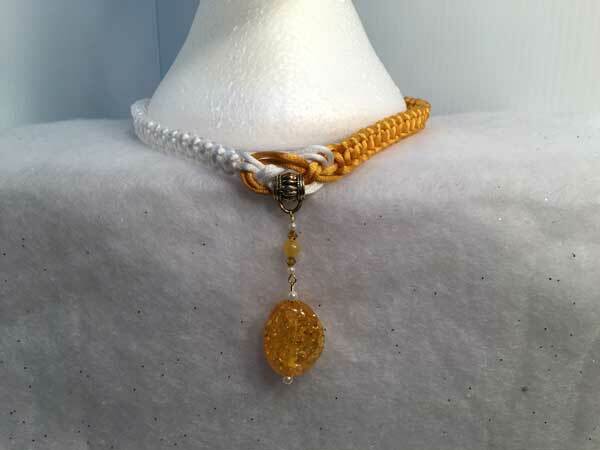 This cordednecklace is made using Satinique cording for a beautiful piece with some beautiful shimmer. It measures 17 inches with a center jeweled piece that adds almost 3 more inches. It is done in shimmering gold and white. The jeweled piece starts with a round, yellow jade which is surrounded by gold bicone crystals and tiny white pearl beads. Hanging separately from that is a large, acrylic, golden, crackled nugget which is also surrounded by small white pearl beads. The piece is finished with a lobster claw clasp and extra chain for added length.